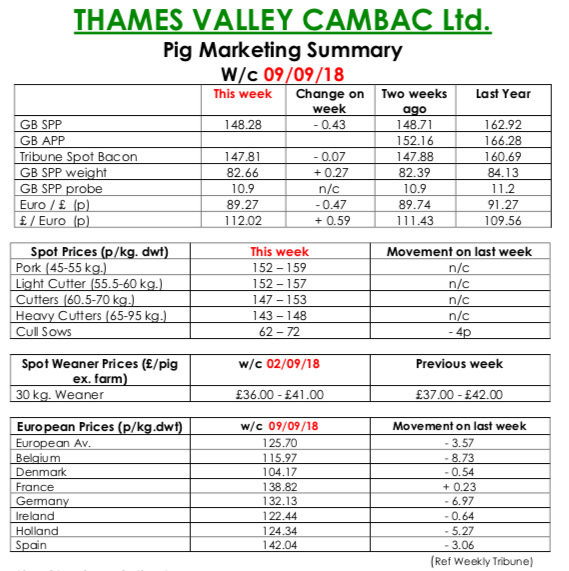 This week’s Slaughter Pig Marketing Summary from Thames Valley Cambac reported that demand held up well as the weather turned to a more autumnal feel. All the majors planned full kills indicating a decent undercurrent to trade. Most weekly contributions stood on, with one exception. Supply improved slightly again but average weights are still tracking 1.5kgs behind last year’s figure. There are indications of a few more pigs in the pipeline which will hopefully match improved demand. The fresh meat market was similar price wise, with odd enquiries for extras from one or two outlets. The cull sow market fell 4p on the back of poorer continental trade, but supplies remained healthy. European prices were in a touch of turmoil, initiated by a 7 cent fall in the German market. This affected its near neighbours with Belgium back nine cents and Holland back five. The rest of Europe was relatively unaffected with France actually improving one euro cent. All quotes in sterling were further tempered however, by a weaker Euro that ended the week down 0.47p at 89.27p. In the Weaner Marketing Summary, for week commencing September 2, the market continued to struggle, with minimal demand for any supplies outside contract arrangements. Some spot market quotes were very low, and some batches remained unsold. The prices announced by the AHDB saw the weighted average for a 30kgs pig quoted at £54.92 and the weighted average for a 7kg rise by 14p to £37.49.